"It's Hard to Be What You Can't See." 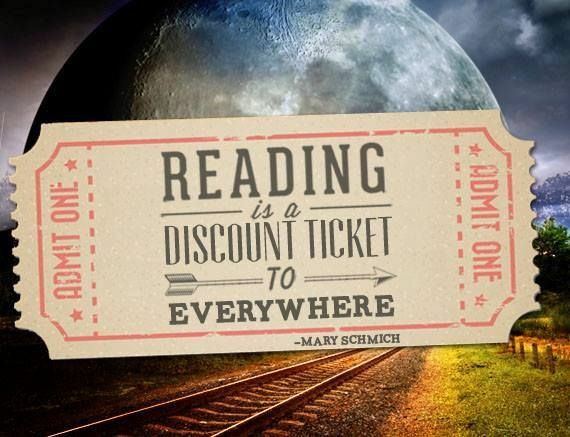 So, read more. 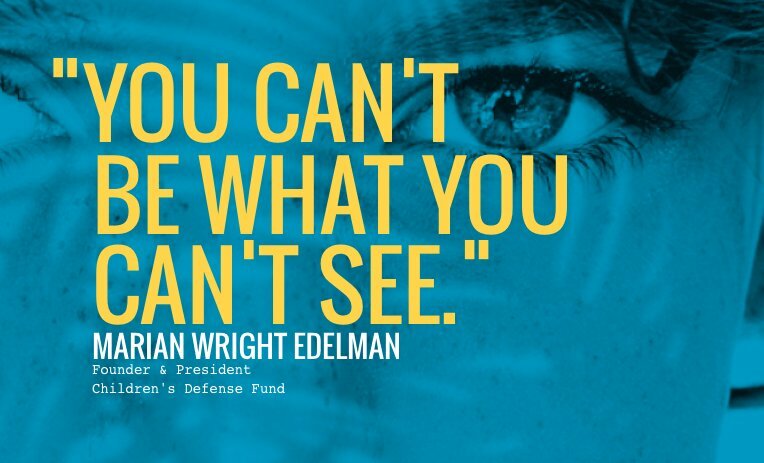 In 2015, Marian Wright Edelman, president and founder of the Children's Defense Fund, wrote an article with the title "It's Hard to Be What You Can't See." In the past few years, the phrase has been co-opted by STEAMsters who use it as a clarion call to educators about student opportunities for their futures. The phrase has become "They Can't Be What They Can't See." I've used it myself and, for many reasons, I think it true. But just recently two things occurred to me. 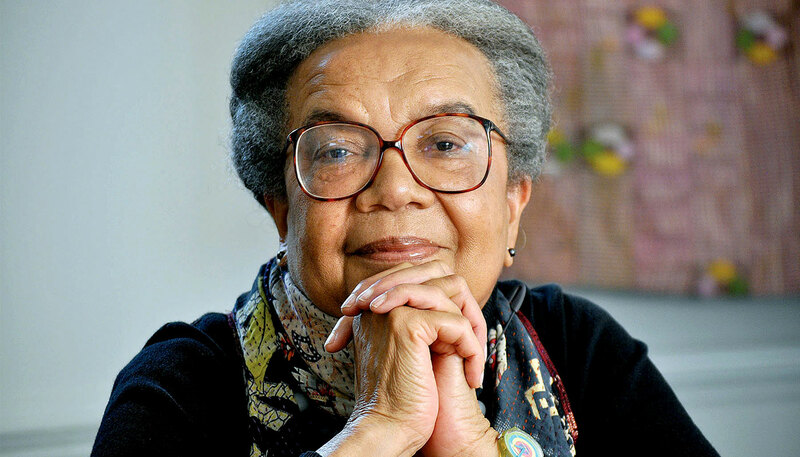 First, perhaps the way we're currently using it is too narrow and second, perhaps we've completely missed Marian Wright Edelman's intent. And so began my research journey. The article itself was easy to find. Ms. Wright Edelman, born in 1939, is still active with the Children's Defense Fund. She wrote the article in 2015 and it was updated in 2016. Before I address the article and my thinking, a few notes. For those who don't know me, I'm a white female of a certain age; I have a doctorate in education; I've worked in various capacities in education, both corporate and non-corporate, for decades and oh my goodness that sounds like a really long time! Why does that matter? Because I know my age and my color influence my perceptions of context. Another lengthy note. I worked for Pearson for several years. I was a director in the Teacher Education and Development Group which was, I think, the final name for our little business unit. I got to work with some amazing people as we crafting professional learning experiences and graduate programs for our university partners. We had video. Beautiful video filmed and edited by the ridiculously talented Jules Burke, founder and president of SMART Productions, and managed and frequently voiced by the also immensely talented Vikki Myers, who is one part of Kingdom Impact Ministries with her equally talented husband Michael. So yes, I was surrounded by talented people. What's important here is that Vikki is not white. As we talked about video options and as we searched for schools that could help us capture the video we needed and wanted, Vikki ever-so-gently taught me the importance of faces of color in the classroom. We often heard teachers talking about how they couldn't replicate a lesson taught by a 4th grade teacher because, for example, they taught 2nd grade. Or they couldn't use anything from a particular video clip because that teacher was elementary and the viewer was high school. Gadzooks people! But we knew that people found it hard to translate a learning experience when the ones they were watching did not look like or sound like them. Even when the grade level and the content area matched, some teachers might say, "Oh sure, but she's only 23 students and I have more," or "Yea, but my school is Title I and urban and his isn't," or whatever nuance and detail did not match almost precisely. By the way, we modified the content to help teachers make the transition though this was often one of the more frustrating parts of our jobs. In this case, they couldn't be if what they saw didn't match their expectations perfectly. Sure, it could be a simple matter of choice or a willingness to be creative and collaborative or any one of a number of things. However, we heard this from new and veteran teachers from all kinds of situations and demographics, and even from those who seemed to want to learn. So my first corollary is this: "Sometimes it's hard to be what you can see." But let's go back to Wright Edelman's article and the points she was trying to make, or the points I think she was trying to make. She speaks first of diversity and global connection. When speaking of diverse books, she notes "it’s not because necessarily everybody needs to see themselves reflected in every book, but because we need that sense of connection." People have been making connections without those reflections, but why should they have to work that hard? And here is the crux. It’s hard to be what you can’t see. Children of color need to be able to see themselves in the books they read. Just as importantly, all children need to be exposed to a wide range of books that reflect the true diversity of our nation and world as they really are. Deep in our heart of hearts we know that. Years and years ago I got to teach literature at the college level, and I'd do that again in a heartbeat (including teaching freshman composition because yes, I enjoy it!). I taught Children's Lit and Adolescent Lit, too, poor me. Because I taught some of the diverse literatures courses, I was always looking for books that reflected those that were rarely seen in my classrooms. Why? Because I knew, knew, in my heart of hearts that books might be one of the few ways to introduce students to those who were not like them. They might never meet someone like Okonkow in Chinua Achebe's Things Fall Apart, or any of the characters in In the Pond by Ha Jin or The Chosen by Chaim Potok or Silence by Shusaku. My goal was to help them see the characteristics that were reflected in their own skin and to figure out what differentiated them, other than accent or geography or skin color and how accent, geography, skin color, and more contributed to that differentiation. Not too long ago a friend recommended Front Desk by Kelly Yang. The story itself is good and the characters are wonderfully crafted. I recommended it to a teacher in a neighborhood school and she wondered why they would read it since there aren't many Asian kids in the school. So we talked about the correlations her students might be able to draw with those of other races, ethnicities, and religions. And that's when it hit me. Yes, using the catch phrase "They can't be what they can't see" is GREAT for STEM/STEAM programs, for promoting all kinds of options for kids who think their choices might be limited or who have no clue what possibilities might exist. But let's go back to Wright Edelman's statement: "Just as importantly, children need to be exposed to a wide range of books that reflect the true diversity of our nation and world as they really are." Kids in rural schools need to have a realistic glimpse of what life is like in suburbia and cities, and vice versa. Kids in white bread schools need to know what life is like when your very being isn't privileged or when it is suspect because your skin isn't some weird beigey pinkish tan (you know we're not actually "white."). So my second corollary is this: "Sometimes it's hard to imagine what you don't know, can't see, and haven't experienced." I know of some students of color who have really limited ideas of the possibilities for their lives. I talked to one of the 6th graders who loves to run and loves to run fast. I asked her if she dreamed about being in the Olympics, if she dreamed of being the next Jackie Joyner-Kersee. She had no idea who I was talking about so I bought her a couple of books about African American women runners, including Wilma Rudolph and, of course, Flo Jo. A few weeks later her teacher sent me the most amazing thank-you letter written by this sweet girl. I know the books have changed some of her thinking and I know the experience of getting books was pretty cool for her. My hope is that now her dreams for herself will change. 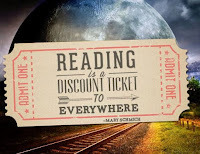 And so, my third corollary, taking quite liberally from Wright Edelman, is this: "We all know more about what we might be and could be when we get to read a 'wide range of books that reflect the true diversity of our nation and world as they really are.'" If we want our kids to be better equipped for this world and the world of their futures, they need to read more. If we want our kids to have more information about what could be possible for them, they need to read more. If we want our kids to begin to imagine what could be possible, they need to read more. And they need to read "a wide range of books that reflect the true diversity of our nation and world as they really are." So have them read Front Desk, Long Way Down, The Hate U Give, Holding Up the Universe, I'll Give You the Sun, and so many more. Let them discuss and reflect in ways that are meaningful to them. Let them discover and grow. Let them learn to imagine.